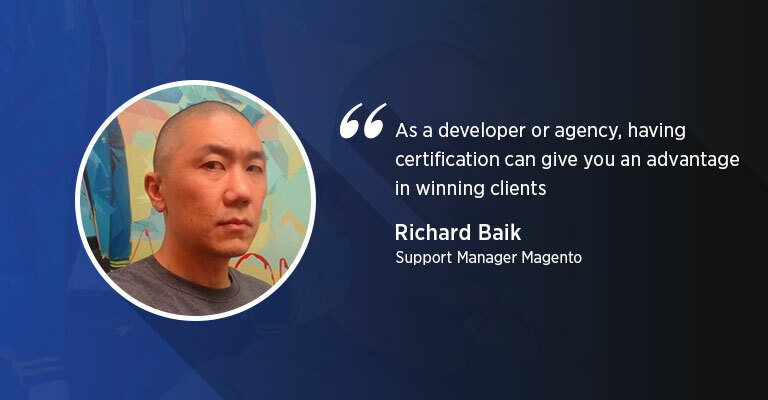 Richard Baik is currently working as a Support Manager for Magento. He has been working with Magento for over 6 years and overall has more than 15 years of experience in technology related fields. He is also a certified Magento Solution Specialist. Here’s my talk with Richard! Muneeb: Richard, thank you for joining us today. How long have you been working with Magento & what is the reason for connecting yourself with it? What challenges did you face initially & how did you tackle your problems and difficulties? Richard: I’ve been working in the technology field for over 15 years. Most of those years in the commerce realm. I’ve been with Magento for over 6 years now. I started in Magento as a Technical Support Engineer, and worked my way up to becoming a Manager. Since I have previously worked in the commerce realm, it seemed like a natural progression to get involved with an ecommerce platform. The main challenge that I faced was the complexity of the platform. This complexity comes from its open source nature, but is also one of its strongest points. I quickly learned that Magento can be enhanced to adapt to many different business uses, and it’s quite flexible compared to other ecommerce platforms. Muneeb: You are a Magento Certified Solution Specialist. What impact did this certification bring in your career? In your opinion, what are the advantages of being a Certified Magento specialist? Richard: The certification validates my experience and knowledge working with Magento. In general, having Magento certification shows that you have put the time and effort to master Magento. As a developer or agency, having certification can give you an advantage in winning clients. Muneeb: We all know that there is tough competition within the ecommerce industry with the emergence of Opencart, Shopify, PrestaShop, WooCommerce, etc. What do you predict is the future of Magento? Richard: From my perspective, Magento is focused on providing a flexible, powerful, open source ecommerce solution. Many merchants choose Magento because other ecommerce platforms cannot fulfil their specific business needs. Muneeb: How do you differentiate Magento 1 from Magento 2. In future what features would you like to see in Magento 2? Richard: Magento 1 is on the End Of Life path. There will be no more feature releases between now until November 2018. We will only be releasing core security updates until that date. Magento 2 is our future and we’re putting all of our energy into it. Muneeb: Magento is very popular around the world. What advice would you give to the merchants thinking about moving to Magento for increasing their sales? Richard: Hire and utilize an experienced Magento developer or agency. Often times, I see merchants think they can just hire any PHP developer to implement a Magento site. And every time, I see them struggle. Muneeb: There are many students and young developers who want to pursue a career in Magento. What suggestions and advice would you give them? Richard: Get more involved. The other powerful thing about Magento is the developer community. There are people from all over the world who are very passionate about Magento. Follow them on Twitter, join the Magento forums, get on GitHub, and attend the meetups and conferences, etc. 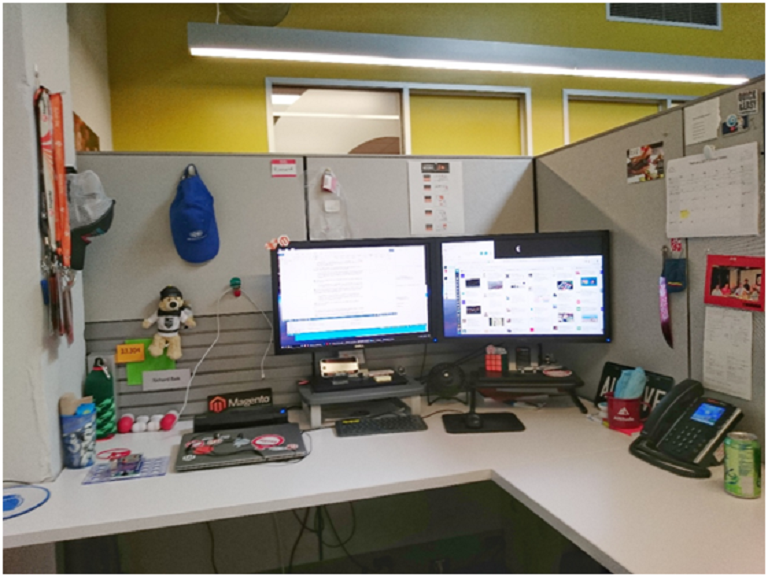 Muneeb: Just for our readers, could you please send us an image of how your desk or workspace look like. Muneeb: In your opinion what are the benefits of attending Magento events? What are your thoughts about Meet Magento & Magento Imagine? What are the benefits to new Magenticians of attending these types of events? Richard: As I mentioned previously, the Magento community is very knowledgeable and supportive. You will learn a lot of from each other, as well as build a network of colleagues. Even if you are not able to attend these events due to distance or cost, you can always start local meet-ups of your own. Muneeb: What are your hobbies? Do you like playing games, watching movies, or hanging out with friends and family? How do you enjoy your free time? Richard: I like to spend time outdoors or do something physical. So I like to run and go to the gym. I think it’s unhealthy to stare at a screen all day and crunch code or whatever. So I try to balance things out by staying physically active. Muneeb: Everyone has some inspiration and motivation for their success in their life. Name some people who have inspired you in your personal and professional life. Richard: Other than my parents, I can’t say that I have specific people that have inspired me. I get my inspirations collectively from people that I meet and interact with every day. Muneeb: Who would you like to be interviewed next on Magenticians? You can recommend your friends or people who have contributions in the Magento Community. Richard: I don’t want to put anyone on the spot! Haha. But I think Sherrie Rohde would be great for an interview. She has been very active in the Magento community, and we’ve been very fortunate to have her join the company.